As the road winds and unwinds amidst the green ravines of the Gurgaon Aravalis, one screeches to a halt in front of this 2000 sq yards sprawling bunglaow- not trying to shout out loud yet demanding attention to its subtle timeless design sensibilities. Designed and curated by Melange, the signature brand of New Delhi designer Sangeeta Kapoor, the house gradually recedes into the brick and mortar and a cheerful, welcoming home takes over providing its owners a delightful respite from the city’s chaos and frenetic activity. Done up reflecting a multitude of inspirations from the modern contemporary to the chic neo classical, the home effortlessly transcends the mundane to interesting creating intimate spaces that lend themselves to conversations and family get togethers. The lobby greets you with an inviting day bed in burnt orange, with a soothing water body on one side and a huge chequered bronze mirror on the other setting the tone and mood for the rest of the house. As one moves into the living area, the warmth and openness of the huge glass windows with beckoning greens invites you to take a deep breath and soak it all in… you sink into the comforts of the beautifully done furniture and are but left to marvel at the clean and uncluttered feel of the space. Each and every piece of furniture and furnishings speak volumes of the eye that visualized it and the hand that crafted it. 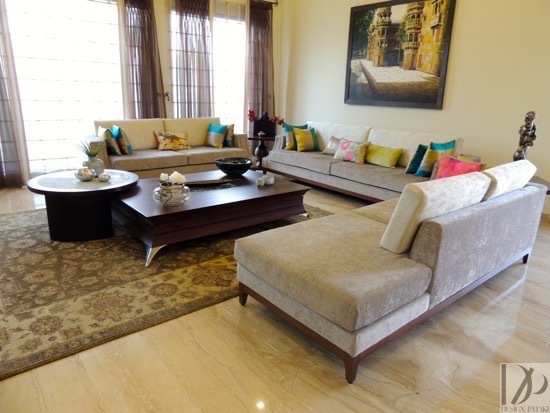 The sofas and and chairs are done in soft beige tones with beautifully cut wooden jaali pattern on the sides, perfectly juxtaposing the minimal classic elements into play. The synergy of design flows into the dining space where the table ‘squares’ it up without cutting any corners- intricate inlays play with the stunning agate marble. An informal bar counter in solid chunk of uneven jagged wood is deep in conversation with the rich black printed bar stools. 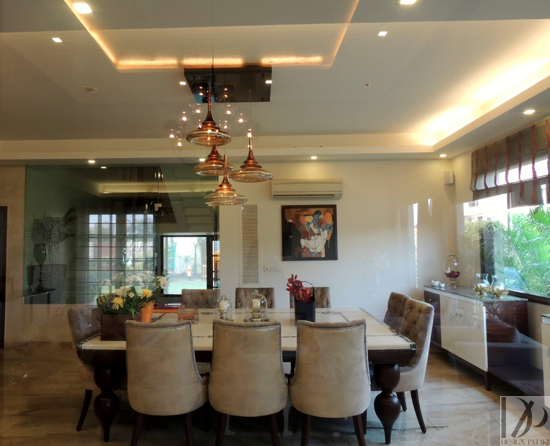 Ivory and copper monotones rule with the soft amber of the suspended chandeliers breaking the monotony. 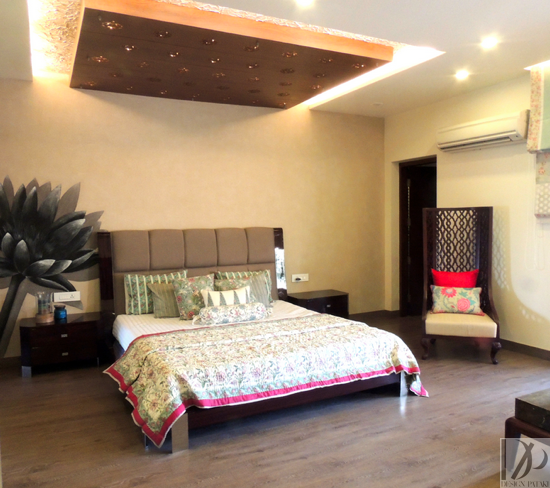 The master bedroom reminds us of the luxury of space in Delhi as it houses a beautiful small dining ( for those oh so private meals in the room) in textured wood with contrasting upholsteries in prints and plains creating an antithesis of sorts. Yet the sight that holds the eye is the stunning art texture behind the bed with a huge flower adorning the wall, painted in hues of charcoal grey and copper beige washed in the shimmer of the warm yellow light flowing down from the laser cut wooden block entrenched in the ceiling. The high back wooden carved chair adds the regal touch. 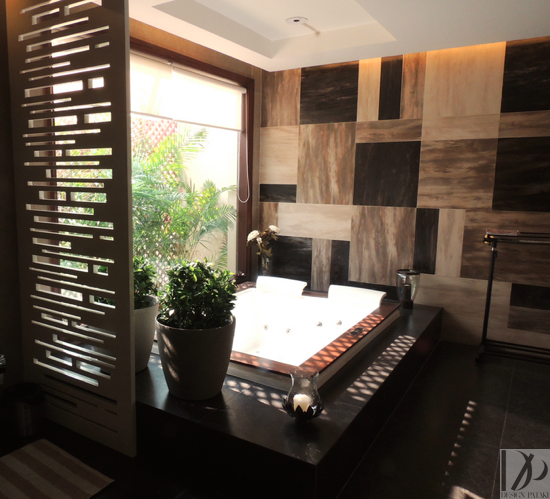 The bathroom is elegantly designed with one wall in a bright checkered marble pattern in copper, black and beige –the sunlight gleams onto the huge Jacuzzi inviting you to soak deep into the sheer finesse of it while a geometrical wall to ceiling panel in lacquer provides the visual barrier. 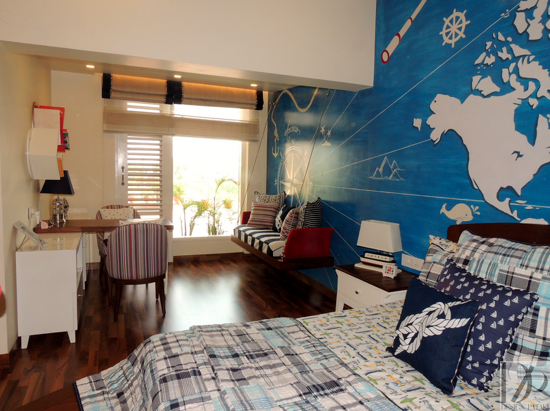 The voyage continues into the sons room with a hugely innovative boat bed in front of a ocean blue painted wall with the continents of the world…. a quirky wooden bunk seat hanging from the ceiling and a two side accessible study table, sure to shoo all the ‘blues’ away, pun intended. Alongside the furniture, the soft furnishings and accessories have been all personally designed and produced by Melange, handpicked by Sangeeta, right from the stunning lilies or the artwork to the beautiful candles and towels in each bathrooms, as beauty and design is in the seamless collaboration of nuances and small details!